Tomorrow morning at 6 am we will be flying out of DC down to old Mexico to witness our daughter, Betsy get hitched. She decided on a destination wedding and Mexico was very reasonable so that’s where they ended up. The wedding is at the Azul Sensatori Resort not far from Cancun on Friday the 18th of May. Its time for daddy to give his daughter away. Keep her in your thoughts. A friend of mine whom we will call Tom (which is not his real name) asked me to help him re-do his patio. It was covered with porous lime stone slabs about 20 x 20 inch and maybe 1 1/2 inches thick. They were corroded and ugly from acid rain that falls in our nation capital. The slabs were not level and did little to make the deck appealing to look at. I told Tom that we could fix it for the price of the materials and a few rental tools and that he would have to remove the old stones and somehow get them to a landfill. He placed an ad on Craig’s List; a man called and soon came to get the FREE pavers. Tom, being the nice guy he is, helped the man pull them up and load them in the truck. All went well so that the new owner of 50+ limestone pavers was soon heading down the toad with his treasure. Tom called me up to expressed his excitement that he had so easily gotten rid of the old pavers. He worked most of the evening preparing the site for the new surface and getting the ground ready for the new pavers and my arrival. The next day he called me on his way home from work. On his arrival home he began to say words I was not used to hearing. What I gathered from his developing anger was that the stones had been returned and dumped in his backyard and that many of them were broken or chipped from being tossed into the yard. Tom was stunned by the audacity of the man’s decision to return the broken pile of stone! There was little he could do other than be upset; he did not have the man’s name, phone number or email. So he rambled on for few moments and then began to address the issue of getting rid of the stones. A local landscaper agreed to remove them for $80, so Tom called him the next day to have the stones removed. Although this story is bazaar by its self, the next event pushes it into the Twilight Zone. The next evening, while Tom is was working on the paver site, a man walked into the backyard. Tom quickly realized that it is the man who took the pavers in the first place! He had returned! Half dazed and shocked, Tom asked him in as nice a way as he could, “What the hell are you doing here? !” The man looks him in the eye and says, “I want to apologize for bringing the pavers back.” At this point, Tom’s brain is in a whirl of confusion. This is the man he would have beaten to death with a paver 24 hours before but he is standing in front of him now apologizing! After Tom asked him a few rather blunt questions which he was not expecting an answer to, the man returned to his truck and left. This story confounds me on several levels. The man explained to Tom that they were limestone, not marble. HE HELPED LOAD THEM IN THE TRUCK! Did he not see that they were limestone? THEY WERE FREE! How can you return something that is free?! Then he returned while Tom was at work and dumped them in the yard in worse condition than he received them. This all seems so hyper-crazy to me. But the part that makes this worth writing about is the fact that he returned to the scene of the crime and apologized! I feel the need to sit down and interview this guy someday to see what is going on behind the eye sockets. Maybe this is a good side of humanity trying to make its way into the light. We will never know the whole story and can only theorize as to what this man was thinking. I guess we will have to chalk this up to someone trying to do what is right in a crazy, twisted sort of way. For too long we color-blind people have been ignored by society. Let me explain my condition and concerns. I have what is referred to as red-green color blindness. Based on my research I have a shortage of red cones in the back of my eyes. In other words, I do not have as many red light receptor cones as the average person does. Because of this I have a hard time telling the difference between green and brown or blue and purple. This inability increases with the decrease in light. The lower the light, the harder it is for me to tell the difference between these colors. It all boils down to the color red. My grandfather, who passed the gene through my mother, was totally color blind and saw in shades of grey, so I guess I am lucky to see as well as I do. Our society has many unwritten rules on how to dress or what colors to use for certain circumstances. These rules have little to no bearing on my selection of colors for most anything, including clothes. Think of all the situations that are color-coded in our society: electrical wiring, traffic lights, emergency lights, exit signs, gender identification, patriotic symbols; even clothes have gender bias. Oftentimes people will produce brochures using dark reds on black or greens on brown creating a very difficult moment for us color-blind people. Since we color blind people ( males make up over 99%) have little say in the use of colors; we are basically ignored by society. Seven out of a hundred men are colorblind to some degree. That makes us a sizable voting block. I am pretty sure that the Tea Party and Republicans will not want us, which by default, leaves us to the Democrats. Another point to ponder is this: women as a group have different color vision than men; some (the women) consider it better. That is how they make up all those silly colors like periwinkle, salmon, mauve or my favorite, fuchsia. Most men have no idea what these colors are and most don’t care! Notice the women hanging out at the paint strip area at Lowe’s or Home Depot. You hardly ever see a man there for more than a minute! We swoop in, find a color we like and tell the clerk to mix it-no wasted time! As Lowe’s and Home Depot have discovered, there are infinite colors in the electromagnetic spectrum and women apparently can see every one of them. So, I propose the COLOR BLIND DISABILITY ACT which would force society to create color appropriate media for color-challenged people. I guess I am tired of everybody else getting special treatment for various disabilities. It is time we color blind folk be treated fair and equal! 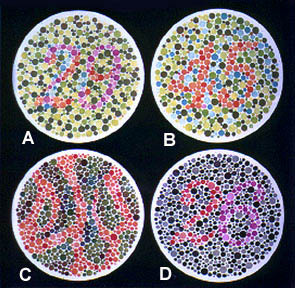 One of the main provisions would to make it illegal to ask a color blind person if he knows what color something is. Every time I tell someone I am color blind, that individual asks me what color my shirt is? NO MORE! Free at last, free at last…to wear whatever color I want!